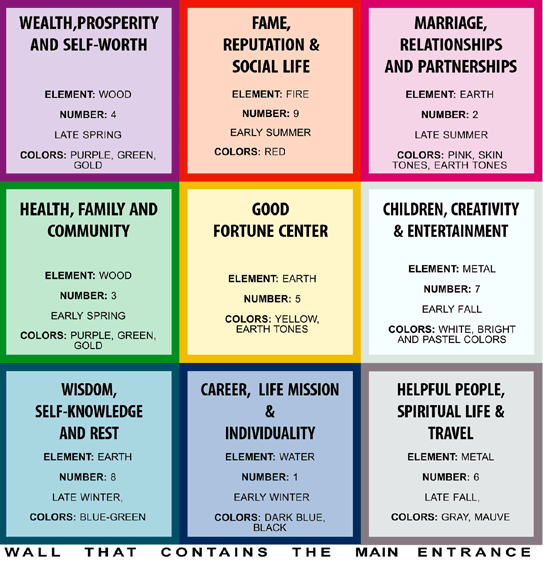 The bagua is one of the main tools used in Feng Shui. It is a map that tells us which parts of a space – be it a house or an office building – correlate to particular areas of life. It is an energy map which allows you to analyse the energy of your space, and enhance your environment in order to achieve your goals and attain harmony and balance in your life. Using orgonite made with specific intentions or specific gemstone combinations in accordance with the bagua can be a powerful way to influence your life. There are a few different schools of thought when it comes to using the bagua, but in this article we will look at the Black Hat method of using the bagua, since it is simple and intuitive. The bagua is mapped over your space according to the main entryway. The entryway is mapped along the bottom side of the bagua. So, your entrance will always be in either the wisdom, career or helpful people section of the map. Once you have determined this, you can easily identify what the other areas in your house represent. Now think about what those areas currently look like, both in your house and in your life. When I first did this, I realised that my wealth and abundance corner was one of the messiest areas of my flat, and that I kept old bills and neglected papers in a mess in that area. My financial life, likewise, was a mess. I decided to clean up the clutter, re-organise, and as a final touch I added several orgonite cones and pyramids which have gemstones that are conducive to attaining prosperity and wealth in that corner. Not long after, I noticed the change in my finances. First of all, if an area of your home is very cluttered, you should tidy and organise it before placing the orgonite bagua. This way it will be more effective. Make sure that all parts of your bagua are neat, ordered and pleasant (or, if you’re the kind of person that doesn’t do neat – try to create ordered chaos. This can be achieved even if you have a lot of things). Now you can place different orgonites in the sections of your bagua. You can use regular orgonite with crystal quartz, but you will have more of an effect if you use orgonite which has been programmed specifically for enhancing the energy in the area of your life that the bagua respresents, or orgonite with gemstones that represent that energy.